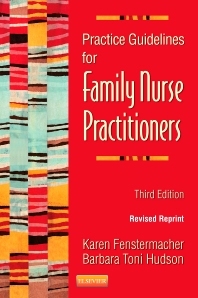 Convenient and portable, Practice Guidelines for Family Nurse Practitioners, 3rd Edition — Revised Reprint offers quick access to essential guidelines for Nurse Practitioners in a variety of family practice settings. Well known for its concise guidelines and extensive charts and tables, this Revised Reprint includes extensive updates throughout and offers vital information on the latest diagnostic methods, treatment options, and drug therapies for primary care conditions commonly seen by Nurse Practitioners in patients of all ages. Quick-reference outline format and a wealth of tables and charts facilitate quick access to essential information. Special populations assessment chapters, including adult, pediatric, and geriatric, allow for quick access to vital information for these specific age groups. Provides essential instructions on which problems must be referred to a physician and which constitute an emergency. Coverage includes the latest national guidelines. Color insert provides visual reinforcement for a better understanding of skin disorders. Compact size and spiral binding make this guide extremely versatile and portable.